Provides a ratio of two parts calcium to one part phosphorus. It is especially necessary for horses in calcium-deficient areas or when feeding grass hay. The daily foundation products are designed to cover 98% of what most horses need. The other 2% is a fine tuning and the requirements will fluctuate with stress, weather, changes in hay, etc. 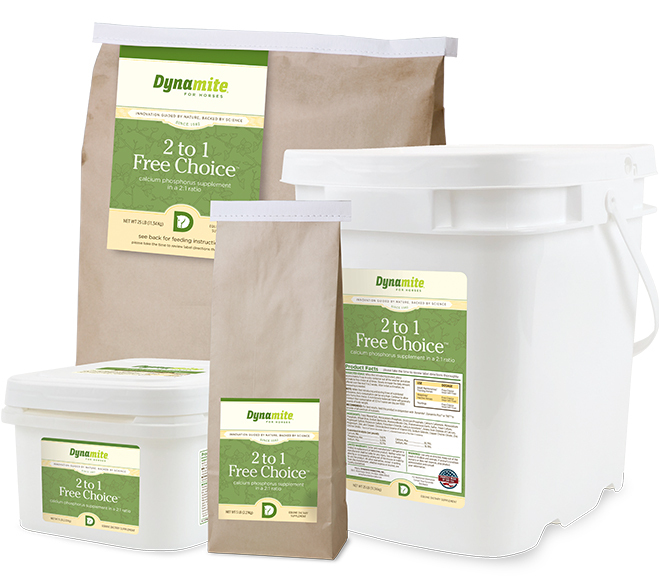 The Dynamite® Free Choice Minerals are included in the Dynamite Daily Foundation Program to provide the nutrients that horses would ordinarily be able to forage for themselves in the wild. We control what our horses eat and it is our responsibility to supply them with the vital minerals missing in their diets. For example, When horses are left to roam freely, they will forage plants growing in calcium-rich soils, and then travel miles in another direction to consume plants rich in phosphorus for the balance. A horse's natural instinct is to self-regulate. We recommend supplying all four of these products in separate, open feeders that are protected from weather so your horses can feed on them in a free-choice manner. 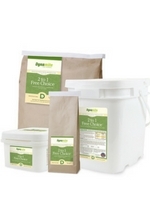 You can also order your 2 to 1 Free Choice in our convenient Starter Pack.